Through 12 weeks of the season, most franchises in the National Football League know whether they are in the playoff hunt or if they need to start prepping for the draft: The Green Bay Packers and San Francisco 49ers have almost clinched playoff berths while the Indianapolis Colts have just about locked up the number one overall draft pick. As the Superbowl hopefuls get excited for playoff runs, most of the league has to sit and wait for April. For five months, most teams have to sit and wait. They are on the outside looking in, watching the playoffs on TV. Eventually, only one team will win while the rest of the league can do nothing but watch. That team will be the undisputed winners, and everyone else will have officially lost. Until draft day. On draft day, every franchise wins. No matter what grades draft analysts give out, the draft gives every franchise hope. Every team, every fan, has this hope that their franchise will land the next great player. Everyone has the same dream, that their fourth round draft pick will turn into a Hall-of-Famer. Yet they have little idea what that fourth round draft pick is actually worth. For years, teams used something like the chart Jimmy Johnson developed as the coach of the Dallas Cowboys in the 1980s to value picks against each other. These values are completely arbitrary: there is no statistical evidence to back up the relative values of these draft picks. There is no reason why the 156th pick is 100 times less valuable than the first overall pick. 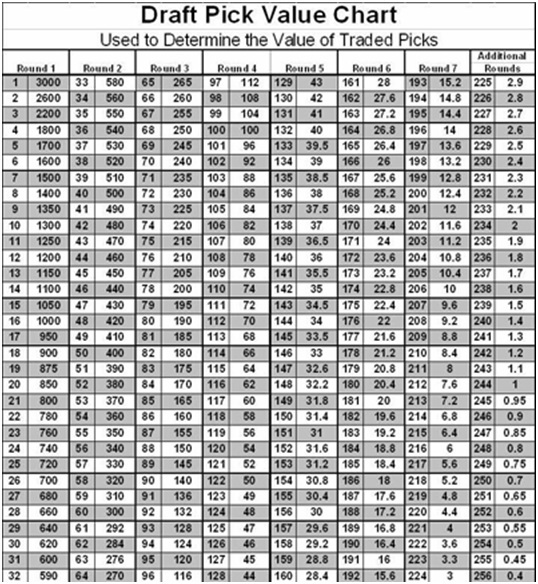 “The Chart” simply dictates how much each pick is worth. These values also have no grounding in the real worth of the players drafted at a given pick. This system is a ridiculous way to value picks because there is no reason behind the values it gives. There must be a better approach. Taking data from www.pro-football-reference.com, I have created a much better system that more accurately values each pick in the NFL draft, similar to the work done by Chase Stuart. Pro-Football-Reference uses a metric called Career Approximate Value (CAV) that allows one to compare players across seasons and positions. It is not meant as the ultimate NFL statistic. It is useful for comparing large groups of players across time and positions, which is exactly the objective here. Using data from 1980 through 2005, I analyzed each overall draft pick from 1 to 224 (the 32nd pick of the 7th round in today’s draft). I found the mean, median, and standard deviation of the CAV for each pick from those 25 years, creating one set of data that represented the historical value of each pick. I then found the mean, median and standard deviation for this new dataset to determine the expected value of a normal draft pick. I then used that normal pick to standardize my data, finding the percentage value over average, or Career Approximate Value Over Average (CAVOA), for every pick in the draft. For example, the first overall pick, historically, has had a mean CAV of 66.7. The standard draft pick had a mean CAV of 15.03. . Thus the first overall pick was 443.39% more valuable than the standard pick. Using this method, I found the CAVOA of every pick in the draft, and then regressed it against overall pick number. The regression equation was with an R2 of 0.91599. The R2 means that the variance in overall pick number explains 91.599% of the variance in CAVOA. Using this equation, I found the expected CAVOA for every pick in the draft. The CAVOA is the comparative value of each pick versus the normal pick and is based off of real, historical, on-field performance. This non-arbitrary statistic is a massive improvement over the old draft chart. To compare my system with the old one, I transformed the old system into a percentage over average as well. The results are below. The old system massively over values the earliest picks and significantly undervalues mid-to-late round picks. The regression line is clearly a better predictor of future value than the old chart. But what do these numbers actually mean in practice? The 94th pick is as close to the normal pick, having a draft value of 100.3 and a CAV of 15. If Josh McCown had retired instead of signing as Caleb Hanie’s backup with the Chicago Bears last week, he would have ended his career with a CAV of 15. So if a team uses the 94th overall pick, it should expect to draft a player with a comparable value to Josh McCown: a marginal backup who may spend some time in the United Football League, but will also have some productive outings in the NFL. 94thpick; so one should expect a player with a CAV of 74. Brad Johnson, Rodney Harrison,and Corey Dillon all had CAV’s of 74. Given the first overall pick, that is the kind caliber player one should expect to draft: Pro-Bowlers who can help lead their team to a Super Bowl victory. One cannot expect to get a player like Peyton Manning, although it is a possibility; instead, one should anticipate a player of Harrison, Dillon, and Johnson’s caliber. The distribution around each pick is also interesting. 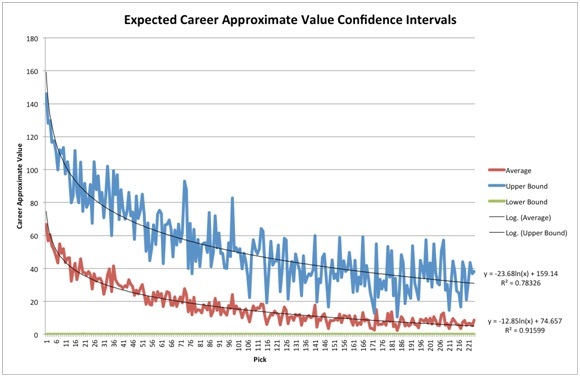 The standard deviation of the expected CAV decreases as the pick number increases, suggesting that picks become less and less variable as the draft continues. While this conclusion is accurate, the coefficient of variation is a better measure of variance than standard deviation in this case. Because there is a separate data set for every pick, one has to compare the standard deviation compared the average of each data set. 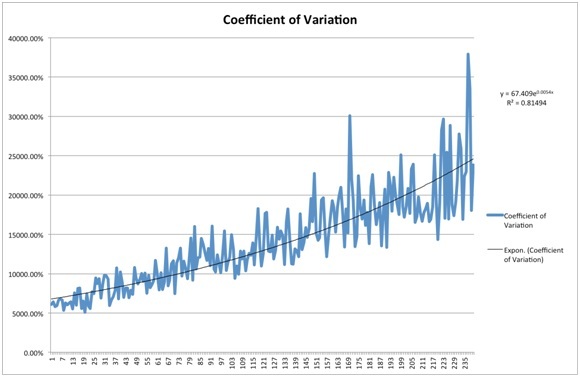 While the standard deviation decreases as the draft continues, the coefficient of variation is constantly increasing, suggesting that picks become much more variable relative to their mean as the draft continues. This finding suggests that one can be more certain of an earlier draft pick’s value than of a later draft pick. That said, it is impossible to predict with any accuracy what a given pick’s CAV will be, as the standard deviations are very large. Below is a graph of the 95% confidence interval for every draft pick. The real confidence interval would include negative values for a number of picks, but since this is impossible, I list them as 0. Each pick’s confidence interval includes 0, meaning that no matter where in the draft one picks, there is always the risk of the player picked being a complete bust. However, the upside of picking a superstar diminishes rapidly as the draft unfolds, making earlier picks extremely valuable. This subject, however, is for another study. This study is the tip of the iceberg of analysis that is now possible to do. There is a ton of work to be done now that we have an accurate representation the value of every draft pick in terms of both on-field value (expected Career Approximate Value) and in terms of other draft picks (Career Approximate Value Over Average). One can use these data to evaluate any trade involving draft picks, come up with a draft strategy that maximizes total expected Career Approximate Value, and much more. This entry was posted in NFL Football and tagged Draft, NFL Draft, NFL Football. Bookmark the permalink. I should have plotted coefficient of variation, like you. I plotted out a smoothed percentile chart, also, which you might be interested in. People care about the NBA draft? Like to see this data broken down by position. My guess is that there is a sweet spot for drafting value at each position. Then you can start to look at this data from a need and value basis when drafting and trading picks. Great idea. Definitely worth follow-up. Interesting to look at the famous Rivers-Manning trade. According to the old system, the Giants got 3000 points in exchange for 2219 (#4 and #65 in that draft, and what turned out to be #12 and #144 the year after). According to your system, they got 494.6 in exchange for 855.4. I think your system is closer to thr truth. By practically any sensible measure, San Diego got the best of that trade. But the Giants won a Super Bowl and Rivers doesn’t look like he’ll ever be good enough. Sometimes stats get in the way of reality. And he keeps adding to them. Compare their numbers though and Rivers is much better, Eli throws a lot of INTs, well not in this last postseason but generally. Comparing the worth of players is really hard, although I understand the need to try and do it. Surrounding circumstances are so different. The Manning v Brady argument for example, Brady has more titles and better stats due to very low INTs but how much the Colts tanked without Manning was spectacular. A lot gets put on titles when people value individual players. I am not saying they do not count at all but it is a team game. Tom Brady admitted he played bad in the AFC Title game. The defence had his back, Manning has a bad day and the Colts lose, end of. I am not arguing for one over the other, just pointing out why direct comparisons are difficult. I would say the level of talent Rivers had in San Diego & Eli Manning had in New York is about equivalent. Eli was able to raise the level of his play and win two super bowls. Rivers is more consistent, but when he’s on Eli is way better when he’s on. As for Brady v Peyton, Brady has had better teams. Even when Brady got injured, the Patriots still went 11-5. Indy tanked without Manning. Eli isn’t close to Rivers equal even when he is on……which isn’t very often. QBs get too much credit for winning a SB and not enough when they lose one. Its a team game and Doug Williams was one of the worst QBs in the game yet he has a ring. You thin k San Diego won that trade? How about those two super bowl trophies? The missing component to valuing picks is cost. The new rookie wage scale drastically reduces the cost of the top picks which increases their relative value compared to drafts conducted under the prior CBA where a top pick could be so expensive that teams may actually have preferred a lower pick. Not taking anything away from the awesome work you’ve done here though. It still provides a way to forecast the output from the picks which is more than we had before. Now under the old rookie wage system, if the ‘free market value’ of 18+19=1, then according to Massey, Thaler (and common sense) a team would rather have the 18+19 picks (since the salaries of those two picks combined are far less than the first pick and you are getting the same production. Under the new system, the number one pick looks a lot better (although probably still not preferred to 18+19) because you do not have to pay nearly as much as before. So, you are correct that the new rookie wage scale makes the higher picks more valuable than they were under the old scale (the production should be the same, the wages are lower, hence the excess value is higher). However, the higher picks are likely not more (excess) valuable than Kevin’s chart. Those picks are still paid substantially more than picks later in the draft. A good way to test this, would be to convert AV to $’s and then subtract actual contract dollars to really know the excess value of each pick. System design note: If a draft is trying to accomplish the goal of talent distribution to the worst teams, then the excess value should be constantly decreasing through the draft (so that the worst teams receive the most value). The ‘right’ rookie wage scale would have a similar shape to the way the productivity falls throughout the draft–if wages dropped faster than productivity, that would mean that for some pick X, pick X+1 (later than pick X) would provide more excess value. *I believe the Massey, Thaler paper only looked at excess value that a player provided on his initial contract, since that is what a team essentially gets from a draft pick (after that, they are paying market rates). Maybe the next iteration for Kevin is to produce a chart that shows approximate value in the first contract (which is tricky because rookie contract lengths vary). To truly value the picks, this would be necessary. Even this approach has flaws since ‘market rates’ is a bit of a misnomer…the best players rarely hit the market (see Manning, Peyton and basically every good quarterback not named Brees). **One last Massey, Thaler point: they went so far as to claim that the top pick was actually worse than a late first rounder (so 1<28). Based on their calculation of excess value, they were right. Of course, excess value is not the only thing a team should look for in the draft; they also need real production. In recent years, the salary cap has not really restricted teams from spending, so they really all could spend more. If teams were right against the cap, the goal would be excess value…when there is space under the cap (from a sport, not business standpoint), teams should be fine paying 'market rates' for production. But doesn’t this system ignore the fact of WHO is drafting? Bad teams are the ones drafting early in the round. But they may be bad teams because they make poor personnel choices, (i.e. they draft badly). So the first pick may not be as valuable to the Cleveland Browns (historically bad drafters) as it would be to the Pittsburgh Steelers (historically good drafters). And, therefore, the values being assigned are skewed by who was drafting when, rather than what a pick should be worth. In other words, Tom Brady increases the perceived value of 6th round picks because he’s a Hall of Famer. But really, the 6th round pick isn’t that valuable, everyone in the league just valued him too low. I really enjoyed this article, though. Interesting stuff! Very interesting points. I agree that this model is more descriptive than predictive. However, there is still a lot that we can learn from this model. One counter-hypothesis: maybe the top pick values are artificially deflated because the “poor” players picked at the top of the draft go to crummy teams and do not receive support, while those picked later in the first round play with great supporting casts and do much better. If your theory were really true, wouldn’t we expect to see it hold up in later rounds as well? Under your theory, the approximate value of curve would trend up (or at least the first derivative would be positive) toward the end of each round as the “smart/good teams” made their choices. A note about the draft: it is important to keep in mind that the draft is by definition a “Winner’s Curse” situation in which the team that drafts a player places a higher value on that player than any other team (otherwise somebody else would have traded for that pick). This will be interesting to see at play with Andrew Luck. In theory, a team like the Colts should not keep the pick because they still have a pretty good option in Peyton Manning (if he is healthy). Shouldn’t a team like the Jaguars (sorry, Gabbert) trade away their next dozen first round picks to get Luck? Here’s a better way to view it: if the Colts did not have the first pick, would they consider trading for it? The answer is probably no…that should also mean that they should not keep the pick…unless no team is willing to offer anything close to their true valuation of the pick. This is a little bit of the status quo bias (lower drafting teams afraid to make a move for fear that it doesn’t work and the Colts afraid to make a move for fear that Luck is amazing) and the endowment effect (valuing what you have more simply because you have it). Great article. As mentioned above, I would love to see the analysis in terms of actual money valuation of the players (and how it has changed with the rookie wage scale) because that’s a huge factor in the minds of team management. I would guess there are (or at least used to be) huge inefficiencies in the market. I’d be interested to see the thirty-two regression curves for all 32 teams since the latest expansion, to see which teams are real draft savants. The spike in average value around the #32 spot could be noise, but it could also imply that a team who can win a Super Bowl is also good at turning rookies into productive NFL players. Which brings up another idea for analysis. Future Value versus Present Value for players. This is something we see in the draft frequently, teams value winning now, and therefore value players that can help them win now. Not to mention the incentive system for coaches pushing them to win now. Therefore if a “Discount Rate” for players could be found that could actually value them with time as factor I think that would be extremely valuable. Your comment on maximizing CAV on the field is important. This chart doesn’t even attempt to measure that. What this chart tells me that if I have the # 1 pick I should be ableto accept a trade for 32nd overall and the last pick of the 2nd and 4th rounds, plus a 7th. I then should be able to trade down that 32nd pick to pick 60 and pick up some other picks until eventually I trade myself out of the draft and have “unlimited waiver wire claims” after everyone anyone in the NFL wants is already gone. but the chart says it’s a “fair deal”. Of course this is ridiculous. it’s about maximizing UTILITY at SOME point in the futre, not some arbitrary number of value whether it’s Jimmy Johnson, or Harvard Sports using a chart. Using this chart you could say well if I can get a 5th round pick this year or a 4th next year, the 4th next year will be a 102.8% annualized return on draft value. Using Jimmy Johnson’s chart you can say it’s worth a 117.97% annualized return. I’m pretty sure you don’t need any complicated value charts to determine that trading for future picks provides a more than adequate return. Except if you are GM and your job will be at risk, and then the next GM is a genius because he has all your picks and gets average value out of them while you are unemployed. Really great stuff. I’m convinced that certain teams (read: Patriots) are way ahead of the curve on the upshot of this analysis, as evidenced by their consistent habit of trading down on draft day. It will be interesting to see if other teams catch on. I’d also be curious to see the pre-and-post regressed numbers on your chart, mostly to eyeball the variance by pick for those of us not well versed in R^2, as well as to maybe find a better fit on the tail. In eyeballing it, it appears that there may be even LESS difference between pick 150 and pick 224 than your curve would suggest. Furthermore, aren’t 7th round draft picks predisposed to getting shafted on personnel and roster decisions early in their career? Once you consider the fact that a GM is a lot more hesitant to cut a 5th round draft pick in training camp than a 7th rounder (thus allowing him to play more and rack up more CAVOA), I’m guessing that the two are practically identical in ability. And just when you think Patriots have it figured out, they trade up twice last year. To their credit they made the playoffs and lost to the eventual super bowl Champions, so perhaps they only needed those two difference makers, and after all the trading down they did in the past, they simply didn’t have the roster room for marginal players. One think that would be interesting would be to see a CVAOA with lets say the top 20,10 and 5 percent of those picks value wise and see how the trendline changes. Looks good statistically but the model doesn’t match the sport very well. Right now I think the Johnson model is still vastly superior, but some adjustments to yours may improve that. If you gave away the last pick in the draft for nothing, most likely, that value could be matched by signing more UDFA. A replacement value needs to be incorporated. With the CAV metric to give a draft pick value you most likely would need to subtract a value close to maybe 5(pure guesstimate) to get a draft pick value as the true value of a draft pick would be close to 62, where the value of the last pick most likely would be below 0, as UDFA typically outperform the last pick, as they get larger signing bonuses in many cases, and a stronger team commitment hence the name “Mr Irrelevant”. Try testing your value points. 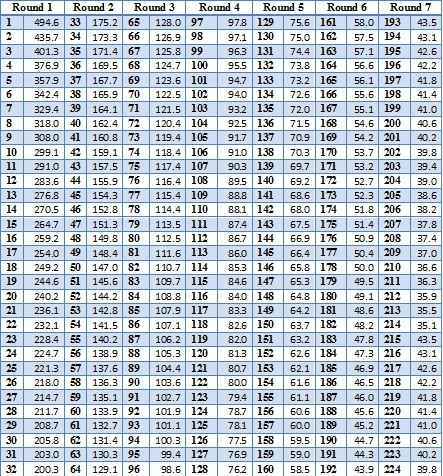 How many draft years can you find where you would trade picks 2-3-4 for the entire 7th round as your values suggest? I can’t find any – though I only looked at maybe 10 drafts. Take a look at 2004, there were 4 guys that made a probowl in rounds 5,6, and 7 combined. 6 players from the same year have made the pro bowl as undrafted free agents. The 2005 draft had 5 players from rounds 5,6, and 7 make a probowl, 9 UDFA have made a probowl. 2006, 3 players from rounds 5,6 and 7 have made a probowl, and 5 UDFA have. If you look at draft picks as a currency and UDFA as players the team can get for free, it shows that there is not much value in picks past the 4th round. I think that most of this talk of trading the 1st overall pick for the entire 7th round is irrelevant. This sort of trade is inconceivable as no team will ever own the entire 7th round as trade bait to begin with, nor is it likely they would have the last 4 picks of the 2nd round. This model is a fairly decent approach to predict draft talent. A GM doesn’t need a model which takes roster sizes into effect. While it is an interesting point, the number of team specific contracts available for the draft is unpredictable. A GM is still capable of using this model in his/her draft strategy keeping the available roster space in mind. Besides, team specific variables such as roster space, draft history, etc shouldn’t be implemented in this model as it is a tool based on averages. Quite a disappointing article, the author is clearly not very critical of his own work. A quick sanity check already shows that the conclusions are complete nonsense (the #1 overall pick has the same value as 12 7th round picks? Really?). The article, as ole already pointed out, ignores the pretty obvious constraint that you can only have 11 guys on the field at any given time. This constraint puts a premium on players who are significantly better than average. For the author a carreer in journalism seems better suited than a carreer in science. The other serious missing component is the value of choice. This type of analysis assumes that a team is equally well off drafting any position, so long as the player is good at that position. a) this runs into the fixed-size-roster constraint mentioned before and b) runs into the similar issue of positions where a team is already strong and therefore needs to not choose yet another player at that position and c) given the volatility of performance from pick to pick, a team will likely have strong opinions on which of the remaining theoretically similar-value players it wants. This choice is akin to a “one-of-a-kind” market dyamic which inherently drives the price up if a team is afraid it will lose its desired pick. RG3 and Trent Richardson are perfect examples of the cost of choice and maximizing value at a position. The Redskins needed a QB, and it’s only worth drafting one to replace a mediocre starter if he’s a likely superstar. They were out of the running for Luck, so RG3 was the only possible choice. They couldn’t afford to not take him, and they paid dearly for it. The Browns moved up one expensive spot to draft Richardson because he was the only elite back in the draft and they feared that another team coveted him enough to jump to the 3rd pick. I do agree that the cost differences at the top of the draft seem too large. For example, why are spots 1-4 separated by 400 points each (a 2nd round pick! ), but then 4 to 5 is only 100 points (4th rounder). That suggests that the top 3 picks are a) consistently sortable and b) far superior to everyone else in the draft. Clearly this is not the case in all drafts, implying that The Chart should be, at best, a guideline. I disagree with your assessment of RG3, as we can see now two better QBs were available in the draft (Tannehill 8th overall & Wilson). Not only that, Washington gave up a Kings ransom to pick RG3 (pick numbers 6 & 38 in 2012 number 22 in 2013 & number 2 in 2014) Even if Washington were equally good this year as they were last year, that would still be Pick numbers 6, 38, 22 & 22 for pick number 2. I took a detailed look at this on my blog, and tried to also trace teams that show up as drafting “well” or “poorly” to see if it impacted their subsequent results (i.e., does this matter?). I think the key for using Career AV or a similar calculation is to look at the marginal value rather than the absolute value. A seventh rounder is thus worth almost nothing marginally over a UFA while a first rounder is worth a significant amount such that you would not accept even every seventh rounder in a trade for the lowest pick in the first round (just barely though, those 32 picks are equivalent in value – if not practicality – to the first pick of the second round). Take a look at http://www.sportsplusnumbers.com and let me know what you think. Out-of-whack valuations (decrease in value) between picks 32 & 33. I noticed this as well. Surely, this cannot be statistically accurate? What gives? Why is pick 214 ~ 8 points less valuable than pick 215 (as well as less valuable through pick -224)? Is there any updated version? Jimmy Johnson’s system is too extreme one way, yours is too extreme the other way. Jimmy Johnson’s system if you have #1 overall, the only team with enough ammo to trade with you is the 2nd overall pick. Using this year’s draft, only the Jaguars have enough total value to trade up to #1 with the Chiefs. The Eagles come close but would trade their entire draft and come “200 points short” or a full 2014 4th rounder. That’s completely illogical UNLESS the player is a clear cut once in a decade talent. Yours on the other hand, would suggest that this year even the Ravens with the last pick of the draft would have enough ammo, and would merely have to give up their 1st 2nd and 4th rounders for the first overall pick! From there, the first overall pick could trade and get multiple picks or whatever and effectively trade yourself into the 6th and 7th rounds, or continue further until you are out of the 7th round. Why draft at all?! Why not just have “unlimited” picks in the 8th round after everyone doesn’t have any interest in fielding an NFL team? Oh you do have that it’s called the “post draft rookie waiver wire”. Also, neither chart captures the pure dynamic nature of the draft. If two people applied this chart literally, there would be no trades between them EVER. There are such things as a “win/win” trades in team sports with individual and varying dynamic pieces within a non-linear system. Example Team A is a team that has a 50% chance of completing an 8.5 yard pass +/- 1 yard on first down. Drafting a running back with a 2.5 yard per carry average +/- .5 yards would be tremendously valuable to them. Team B is a team that goes for the homerun on first and 2nd down and just goes for a 50% conversion on a 10 yard pass on 3rd down. To them, a runningback with a 5 yard carry average but very inconsistent would be more valuable, and a short yardage back would have ZERO value. If both teams trade players so each has a better fit, or if they trade picks and end up taking the respective runningbacks, Even though one team misses out on the more talented runner, they both produce more wins than last year even if all other moves they make are neutral. 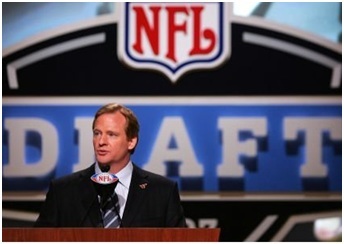 Pingback: "How to Value NFL Draft Picks"
This is an interesting study. I am always curious about the discount rate on draft picks, i.e. what is the value of a given pick today in terms of next year’s draft. I’ve observed that a given pick today is worth a higher pick next year but wonder if that is a linear transformation or varies by round (and pick). A possible partial explanation for this is the uncertainty associated with the future pick’s place in the draft, as the trading partner’s draft position for next year hasn’t been determined yet. Say the discount rate right now is fair (a 2nd round this year for a 1st next year). If a team traded everything but first round picks, eventually they will have 7 picks in every round. At this point until they decide to break the pattern, they will INDEFINITELY have 7 1st rounders. So it doesn’t matter what the discount rate. At some point the team trading to build for the future will have an indefinite advantage and have 7 times the number of first round picks as average, IF they allow those picks to compound by continually trading their returns. They may give up huge odds to win a superbowl for the next decade, but until the end of time after that the team that did this will have an advantage and a dynasty. This HAS to be the more favorable approach. Very interesting analysis. I agree with the premise behind the work and this does open a lot of avenues to be further analyzed. Looking at the two charts though, the practicality of what acutally happens or could happen (in this year’s draft) is quite interesting. What this doesn’t account for is the year-to-year draft classes (potentially not possible), or the individual needs of the teams relative to position in draft. 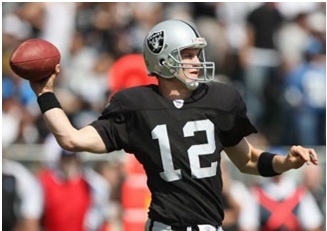 In an example of a possible 1st round trade, take the Oakland Raiders and the Arizona Cardinals. The consensus is the Cardinals need a franchise T or franchise QB. And being this close, at pick 7 they have a chance to get that player now. While this is debatable, the scouting rehtoric has two franchise tackles (Luke Joekel and Eric Fisher) and 1 franshise QB (Geno Smith) … again this is very debatable in its own right. For the Cardinals to move up in the ‘Old’ system, to the 3rd selection, where Fisher, Joekel or Smith would be guarenteed, based on team need…they would need to send Oakland the Rnd 1(7), Rnd 2(38), Rnd 4(103), and Rnd 5(140) at least. For the Cardinals to move up in the ‘Meers’ system, to the 3rd selection, where Fisher, Joekel or Smith would be guarenteed, based on team need…they would need to send Oakland the Rnd 1(7), and Rnd 5(140). While the Meers system is more ‘logical’ I don’t think it’s a stretch to say Oakland would hang up immediately presented with the 2nd offer. 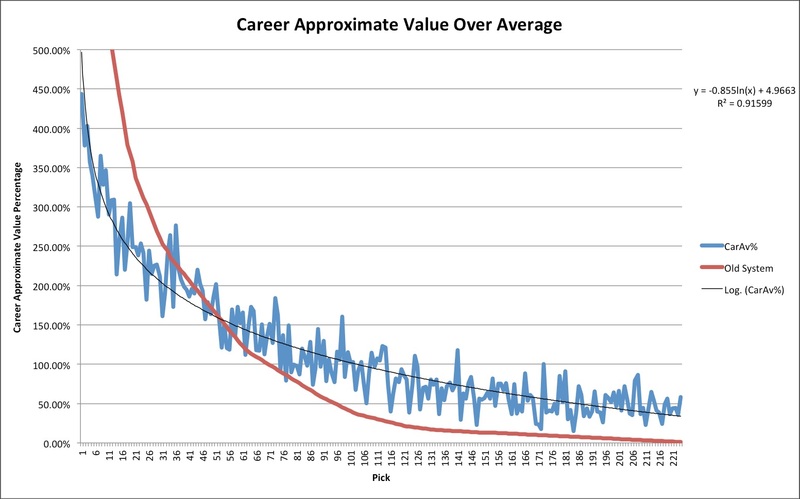 Career AV is a terrible way to measure draft value. A team full of Josh McCown level players would win 2 games. A team of Corey Dillon/Rodney Harrisons would win 2 Super Bowls a decade. A Josh McCown is worth vitually zero in trade value. A Corey Dillon is a 2nd round pick even with a lot of miles and a bad reputation. Better proxies for value would be trade value, value of free agent contract, and career earning after rookie deal. are not understanding anything fully, but this post presents pleasant understanding even. Pingback: Anatomy Of A Trade Down: The Quiet #13 Pick - Sport Spy – Get Your Sports On! After going over a handful of the articles on your blog, I truly like your way of blogging. I book marked it to my bookmark website list and will be checking back soon. Take a look at my website too and tell me how you feel. Great details on how to value NFL picks. Thanks for sharing this, can’t wait for 2014 NFL Picks list. Pingback: Rise & Roar: Is Tyler Haws getting Screwed by Jimmer? | Holy Rivals! Two questions about your table: Why the drastic decrease from the 32nd pick (200.3) to the 33rd (175.2)? The values of the surrounding picks, above and below, gradually decrease by about 3 at that point in the table, but surely the second round status of the 33rd pick would have no statistical bearing on its value, let alone one of that enormity. The first picks of subsequent rounds do not suffer any such drop off, to that point. Also, why do the last ten picks seem to be an exact duplicate of picks 193-202, thus making them more valuable than picks 203-214? Pingback: The RamPage | How Much is an NFL Draft Pick Worth? Don’t know if this system is still relevant or not, but curious as to how you see the scenario KCChiefs Alex Smith worth? Rumor has it he is supposedly going to be traded after the 2017-2018 year to the Bills. No matter where he goes, what would be a good round pick for him? He is having a really good year so far. 25 touchdowns, 5 INT’s, 3738 yards and a passer rating of 105.4. Now granite he is in his 13th year and will be in his 14th next year. What type of grade or draft pick would he be worth to another team? What round should KC get for him?